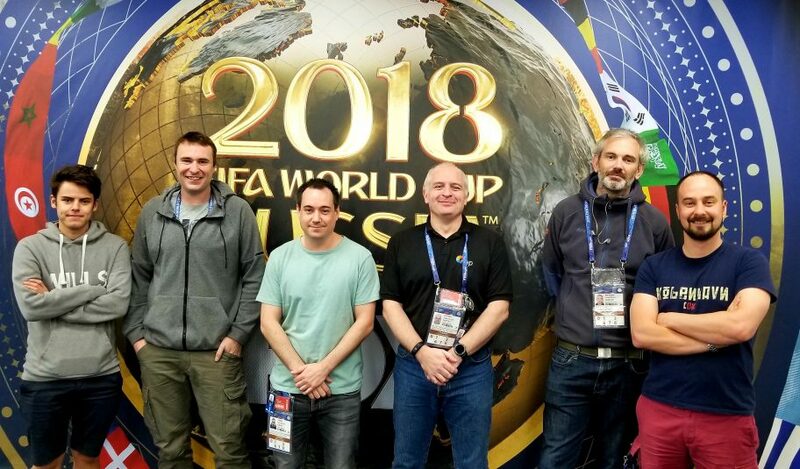 NEP’s presence at the World Cup extends across a wide number of clients, and, at the IBC, Fox Sports U.S., Fox Sports Brazil, and Telemundo are relying on the remote-production–services provider as the backbone of their technical facilities. NEP UK is working behind the scenes at the World Cup in support of Fox Sports. Hugh Potter (third from left) leads the team. The NEP presence for Fox Sports is anchored in the IBC with an Imagine 450×650 Imagine IP3 router at the hub supporting a production-control room, audio room, EVS replay area, and ingest area. It also supports a technical-manager area for signal switching and managing the CenturyLink circuits that allow the Fox Sports team at the IBC to connect to the studio at Red Square in Moscow and to Fox Sports in Los Angeles. At the core of the production-control room is a Grass Valley K-Frame Kayenne production switcher. A second K-Frame S series is used to insert graphics and commentary into the UHD feed, which is sent to the U.S. fully produced and ready for distribution. EVS gear also plays a big part: on hand are 13 EVS XT3 replay servers, 17 EVS XTAccess units for transcoding, 14 EVS IPDirectors, EVS DB servers, and EVS XFiles. Telestream Lightspeed encoders play a crucial role for the facility, which is operating in 1080p at 50 fps. NEP gear at the studio in Red Square includes the cameras and related support gear as well as the Lawo V Remote IV units handling transport of audio and video signals to the IBC. The big leap has been the move to 1080p/50 as a house format, and Potter says it has been fairly straightforward. The biggest issue has been that the 3G transport of 1080p signals can be one of three formats — Level A and Level B dual link, and Level B dual stream — and not all equipment supports all three. At the IBC, Fox Sports is operating in Level A, which is the direct mapping of uncompressed 1080p at 50 fps. Long in the works, the World Cup project has been a bit of a marriage between the NEP UK team and the Fox U.S. team, which also did some of its own integration work. For example, Fox Sports shipped over some preconfigured racks of equipment for outbound-circuit support that it had assembled at its Charlotte, NC, facility.